Where are we and Shakespeare are likely to be transported as a consequence of new media’s seemingly imminent supersession of conventional staging practices in favor of virtuality? The virtual reality work undertaken by CREW’s “Hands-on Hamlet” and Kit Monkman’s “green screen” Macbeth promise to move us closer to a Shakespeare unmoored from physical grounding in a shared material world. They project a future in which the human actor no longer figures in performance except as a ghost of her former self. 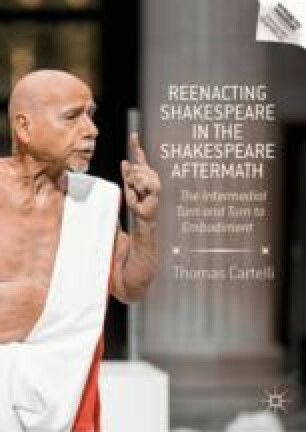 Other developments, however, demonstrate the resilience of virtuality’s seemingly receding other, physical embodiment, as evinced in the insistent materiality of Thomas Ostermeier’s recent Hamlet production and the difference women’s humanly present bodies and minds make in the recent trilogy of all-women Shakespeare productions directed by Phyllida Lloyd.